Discombobulated to Calm - Welcome Authors! Do you think you have everything planned for the day ahead? How about the week ahead? That’s what I thought last week and then my whole week was upended by circumstances beyond my control. Nothing terrible happened – just a LOT of stuff that kept coming up one thing right after the other. There was other people’s stuff that caused an interruption to my schedule—a sick child, a forgetful parent who needed help, noisy roofers up above with no prior notice, and someone simply unprepared for our time together. The reasons and excuses kept coming, and so I watched helplessly as my perfectly planned schedule got totally rearranged. I tried to roll and flow with it – but come on! All this uncertainty really messed with the control freak in me. I was discombobulated, out of sorts, and even a little irritated. I was in a bad place. Look, I have written about “perfect timing and divine order”, I’ve talked about it and did a webcast on this very topic. And yet, when uncertainty presented itself, when a monkey wrench was thrown into the mix, when I felt at a loss, and at the mercy of everyone and everything else, I caved. I let it get the best of me. I allowed myself to be consumed by the injustice of it all. I mean, come on, Universe! What gives? “In my uncertainty I find my security”. I breathed in these words and made a decision—I decided to relax into it. What happened next was pretty amazing (and at the same time pretty predictable). The good news is I ended up getting a jump on other things. I rescheduled appointments to an even better time for me. I had time to relax, talk to friends and family, and organize my workspace. I had more time to cook, put in a new ventilation fan, go to the beach, spend some time shopping, go out for dinner, and relax! It was a little shift in thinking that I wish had come a few days sooner, and yet I am reminded that all things truly are in perfect timing and divine order. All is well. 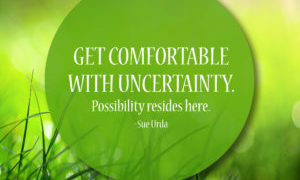 Get comfortable with uncertainty. Possibility resides here.